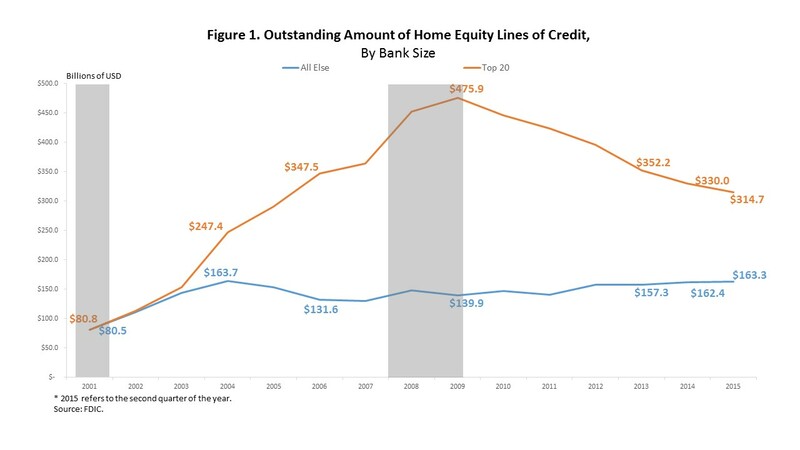 According the Federal Reserve Bank of New York the outstanding amount of home equity lines of credit (HELOCs) was the only debt category to record a decrease in the third quarter of 2015. Home equity lines of credit are an important source of financing for home remodeling projects. Over the quarter, the outstanding amount of HELOCs fell by 1.4%, $7 billion, and over the year, it shrank by 3.9%, $20 billion. An earlier post documented the decline in the outstanding amount of HELOCs beginning in 2009, and the most recent report from the Fed indicates that the trend continues. According to bank-level analysis of the Consolidated Reports of Condition and Income, commonly referred to as “call reports”, the decline in the outstanding amount of HELOCs reflects a decrease at larger-sized banks. In contrast, the outstanding amount of HELOCs at smaller sized banks has risen in recent years. As illustrated in Figure 1 below, in 2001 the outstanding amount of HELOCs at the 20 largest banks as measured by total loans and leases, was equal to the combined amount of HELOCs on the balance sheets of all other banks. The outstanding amount of HELOCs was split nearly evenly until 2003, even as the total amount was rising. However, beginning in 2003, the outstanding amount of HELOCs on the balance sheets of the Top 20 banks soared, peaking at $475.9 billion in 2009. Since 2009, the outstanding amount of HELOCs has collapsed, falling to $314.7 billion by 2015. Meanwhile the outstanding amount of HELOCs held at all other banks doubled between 2001 and 2004, but then declined to $131.6 billion by 2006. Instead of an up-and-down cycle, the outstanding amount of HELOCs held at all other banks remained steady through the financial crisis. 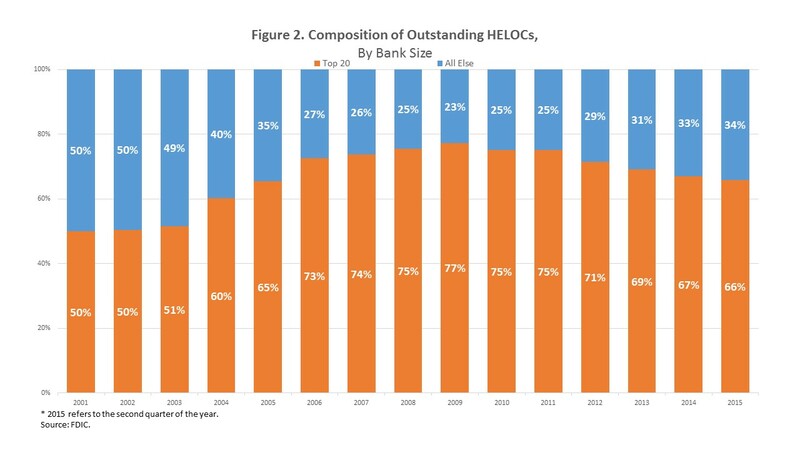 In recent years, the outstanding amount of HELOCs held at other banks has risen slightly. Since the outstanding amount of HELOCs on the balance sheets of all other banks is rising while declining at the Top 20 banks, then the gap between the two cohorts is converging.